As you can imagine, birthday cakes are kind of a big deal in our house. I always let my boys choose their cake, so we start talking about birthday cake themes several months before the actual birthday celebration. Typically, Jack is my steadfast, predictable child who knows what he wants. 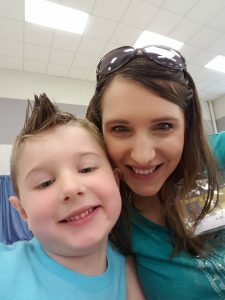 I have noticed, however, that since he began kindergarten in the fall, he’s not quite so predictable anymore. This year, his birthday cake theme ideas ran the gamut between monster trucks (we did that last year) and an under the sea cake. He ultimately landed on one of his latest obsessions–Mario. Now, we aren’t super techy people, especially when it comes to the boys. They just received a Kindle Fire tablet for Christmas and we are still rocking the old school original Wii gaming system. And while I’ve always known of YouTube’s existence, we never spent much time there–until recently. Somehow, my boys discovered that instead of playing video games yourself, you can watch OTHER PEOPLE play video games on YouTube. Again, I’m not techy at all, but I assume that there is some way to record yourself playing the game and then upload it to YouTube for others to watch. The boys would sit there all day and watch Mario, Luigi, Bowser, Toad, and the whole gang run around on the screen if we let them. They actually say, “I’m Mario!” and “I’m Bowser!” They love it. 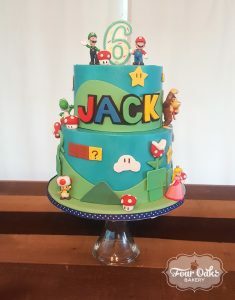 So, I wasn’t super surprised when Jack said that he wanted a Mario cake. I thought it was a great idea! Ryan found a set of figurines to place on the cake and we spent several hours together creating various iconic items from the Super Mario Bros. world. We were very pleased with the finished product and Jack beamed with excitement when he saw the cake for the first time all put together. That was all of the reward that I needed. Honestly, the pictures don’t do this cake justice. 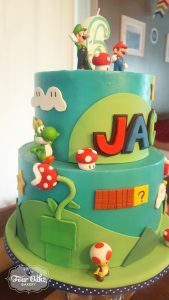 The colors were much brighter, just like in the video game, and the details really popped from the cake when seeing it in person. Jack requested chocolate cake for the top tier and funfetti cake on the bottom tier and both tiers were filled with raspberry buttercream–he has good taste! I covered both tiers in a super smooth layer of vanilla buttercream that I tinted a bright blue. For his birthday celebration at school, I was able to get him to narrow down his wide range of requested cake flavors and frosting colors. As a former preschool and elementary school teacher, I could just hear the “I want chocolate!” and “I want vanilla” and “I wanted green frosting!” So, I did his teacher a favor and had him choose one cake flavor and offered to swirl together two frosting colors. 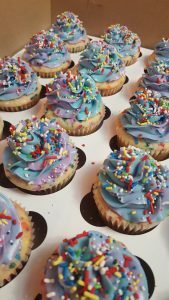 He chose funfetti cake and blue and purple frosting (his two favorite colors). I think that he was just so proud and excited to walk down the hall to his classroom while carrying the big box of his birthday cupcakes. I saw him later that day at school for his birthday lunch and he was beaming with excitement. He really felt special that day and that makes me so happy. I love you, Jack! Happy birthday! We’d like to thank you for the fantastic cakes you made for Amy and Jason’s wedding. The chocolate and peanut butter cake was our favorite. You did a great job with the taste, …..just the right amount of flavor and icing, neither one overpowered the other. The funfetti cake was extremely good, too. I had to eat about six pieces to make sure. In fact, the cakes were so good, I’d like to inquire about a birthday cake for Amy’s mother Donna. She really liked the chocolate with peanut butter icing. Her birthday is Thursday , November 16th. I’m not sure if we’re giving you enough time, but if you can do it, we would greatly appreciate it.